There was highly dynamical circulation development over the Central Europe during Eastern weekend with deepening cyclone movement from Mediterranean area across Alps toward Poland and the Baltic Sea. Several thunderstorms occurred over Slovakia in the afternoon on March 31st. One of them was captured nearby Kralovsky Chlmec in the Zemplin district area (southeastern part of Slovakia). We can see distinct supercell features on the images where mesocyclonic rotation and RFD gustfront low level clouds can be recognized. Pseudotemp sounding shows very strong vertical wind shear environment with veering of the wind but low CAPE was present. However, the instability indices are not very important factor in cases of rotating updrafts because environment is typically modified by storm development and movement. 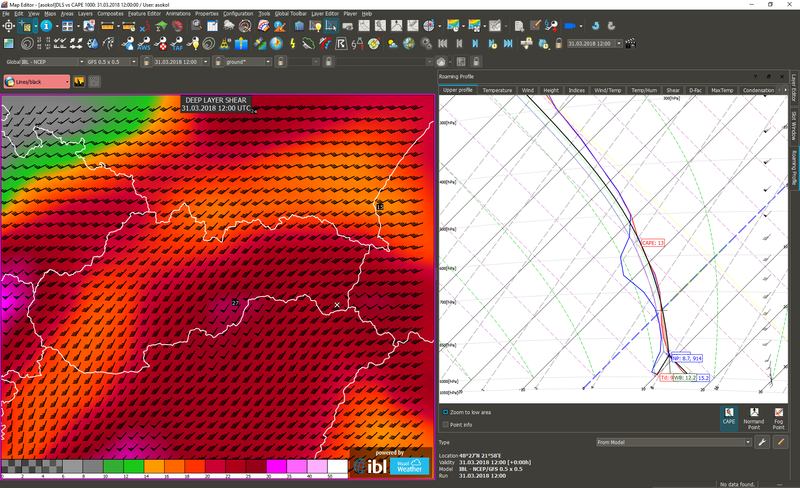 The research of this case is still ongoing but we are pretty sure it was one of the earliest supercell storm case during spring season over Slovakia. Deep layer wind shear and pseudotemp sounding on March 31 st, 12 UTC close to area where photography was captured (the cross on the left part of image). 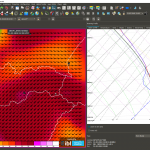 The environment was characterized by vertical wind shear up to 25 m/s and almost zero mean layer CAPE.